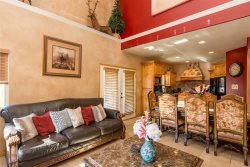 This is an amazing one of a kind Moose Hollow condo. Beautifully decorated, everything is comfortable and cozy. Spectacular mountain views from the front balcony, windows and back patio! Located on the second fairway of the beautiful Wolf Creek golf course. Make this your home away from home at the beautiful Wolf Creek Resort. There is also free high speed WIFI internet service and access to 2 hot tubs nearby. Master Suite has King size bed and private bath, flat screen TV and DVD player. Beds are top of the line mattresses with luxury sheets and chenille fabric blankets- talk about luxury and comfortable, windows and views here too. Entire bottom floor, heated with radiant heat. Third Bedroom: Queen bed and separate bath as well. This beautiful condo has a gourmet kitchen with granite counter tops, stainless steel appliances and a double oven and bar style seating as well as a kitchen table that seats up to 8 when extended and stools are moved. This unit has radiant heated floors on the lower level! Great for those cold winter nights! Located minutes from Powder Mountain ski resort, Snowbasin ski resort and Nordic Valley ski resort. This is a skier's dream. The shuttle stop for easy transportation to powder mountain is literally steps from the unit. Enjoy all the comforts of home while vacationing in paradise! We absolutely enjoyed our stay. The place was beautiful, comfortable, and the place was spotless. We are talking about coming again. Thanks again for sharing such an amazing place.